For the past few weeks, I’ve been trying to understand you. Desperately. You have become my burning question — as a teacher, as a mother, as a human ever entwined in the vast web of technology. When I first joined your user ranks in 2009, I quickly denounced you as “shallow,” as the traumatic pregnancy and then joyful birth of my first child garnered many (many, many) fewer “likes” than, say, the reported online gaming scores of my various FB friends. Later, you broke my heart again and again by offering two “suggested friends” — one an acquaintance and one a dear friend of many years — who both died too young and suddenly, tragically. I began to think a lot about branding and marketing — how, in simpler times, we were not required to consider ourselves to be commodities. Now, we protect the brand and build recognition. And this instinct, protection, is probably the right one when so much is at stake — careers, relationships, futures. FB, who am I to you? Your algorithms may point to a handful of my hopes and dreams, my base human desires. But do you really know my mind? The quality of my character? How have you distilled my real, complex human life into posts and a “timeline”? We are so easily tricked by advertising — compelling stories, essentially. Yours is an advertising campaign of the ego, purporting to tell the full story of our lives. But often (not always) the heartbreak and struggles are missing. We’re really just supposed to keep it happy, aren’t we? We use you to craft our personalities and in doing so, you use us. We know this. But we are natural voyeurs, and egoists. We keep showing; we do not look away. I know that you will evolve, sooner rather than later, and that we will evolve, too — our local and global cultures, our habits, our patterns of thought. Yes, even our bodies will bear the mark of your influence. What does this mean for the future? For our children? Even now, my toddler presses her thumb against images in her picture books, screaming with rage when they do not react to her touch. (How did she learn this? What happened? One seemingly innocuous app transformed my child into a mini-cyborg, flicking through photos as if my iPhone were simply an extension of her body.) And worse: I see this and think, Should I post a picture of her cute distress? What unforeseen challenges will you gift Boy and Girl in 10 years, or 15, when unbridled social drama and new sexuality will rule their hearts? (True, you’ll have a different name by then, and a different form. This does not comfort me in the least.) This is at the heart of my burning question — how do I parent through the inconceivable? I am discovering you in every post — your vast potential for confession, creation, forgiveness, obsession, activism, journalism, collection, distraction (a lot of distraction). We consume and are consumed by your randomness. At best, you allow us to easily connect with people across great distance — real or perceived — even though their political or religious affiliations, their socioeconomic classes, their ideologies may vastly differ from our own. At worst, you polarize and isolate further by encouraging a “with-us-or-against-us” mindset. After all, we like being on teams. Black and white is easy; gray takes something grittier, more tangible. Frankly, I see no great depth of dialogue here. And yet, I stay. I am beginning, slowly, to see you as a vehicle for aizuchi — a sound or set comment in Japanese that means, simply, “I heard you — I’m listening.” Perhaps this is shallow. But I also see it as deeply humanizing and good-hearted. This, for me, may be the saving grace of you. Friends, I hear you — I’m listening. P.S. I thought you might like this photo of a big banana. I’m embarrassed to report, but felt I should anyway (as I know you’ll appreciate my personal disappointment in this fact), that I immediately wanted to “like” this. Ugh. I’ve been infected. Thanks, Jen! And I know what you mean. . . we keep framing waaay too many experiences in terms of FB-ish lingo. Argh. 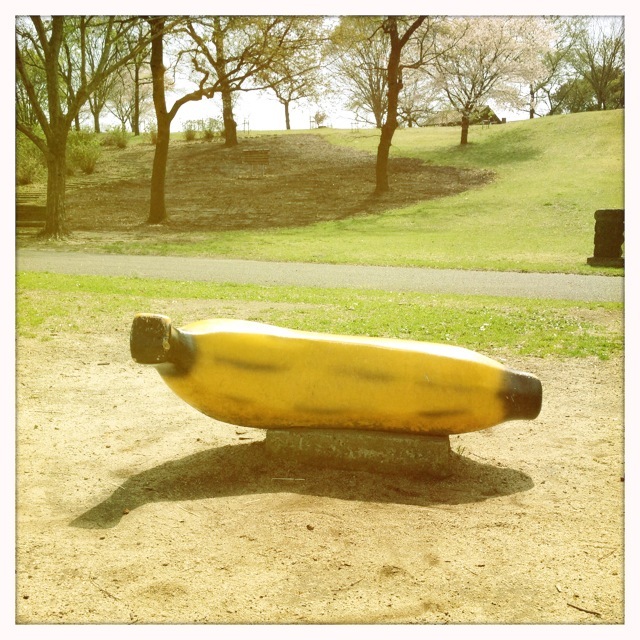 Tracy, I am not on Facebook for reasons of my own that are largely outside this discussion, but I wanted to write you a note to say that the picture of the big banana made and keeps making me very happy.